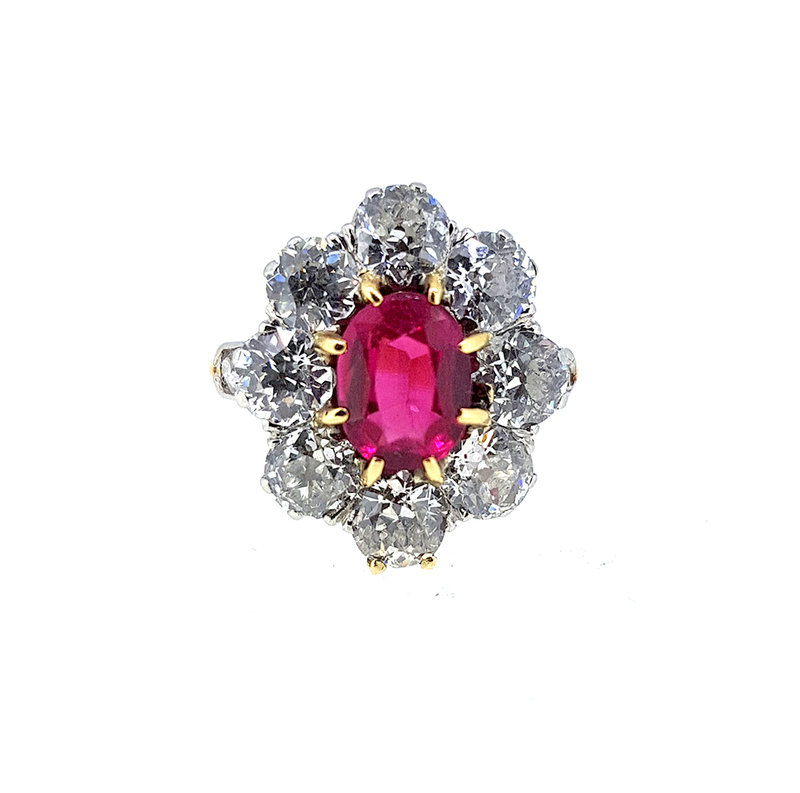 Item description: * A truly lovely antique circa 1890 19th century Victorian era ruby and diamond cluster ring crafted in 15 karat yellow gold and platinum diamond settings. The large rectangular oval cut ruby exhibits a great red color known in the ruby trade as pigeon blood color with a superb medium slightly purplish red hue with a very saturated and even color. 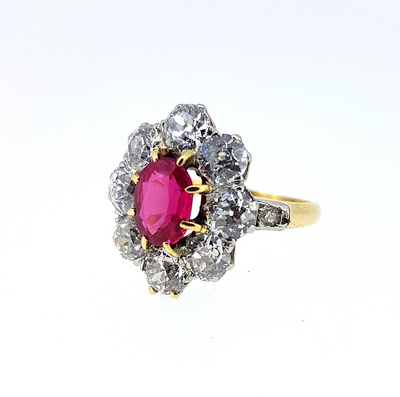 The ruby is an early example of a 19th century synthetic gemstone and has a flawless clarity and measures 7.85x5.97x3.46mm, having a weight of 1.45 carats. 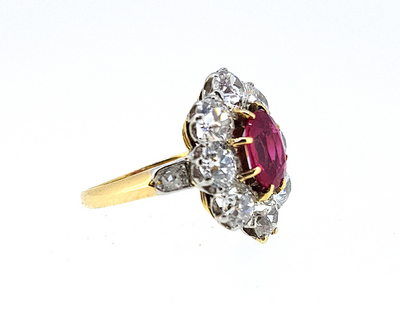 The ruby shows some typical minor wear to edge facets that is consistent with age. 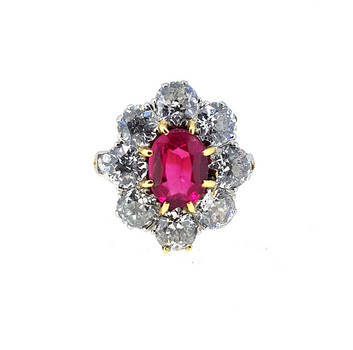 It is surrounded by a stylized pansy / flower cluster of 8 large round old European diamonds having an average diameter of about 4.60mm each and total estimated weight of over 3.00 carats. There are further 2 smaller round diamonds (1.5mm each) to accent the ring shoulders that are supporting the cluster above them. All diamonds show a perfect E-F white color and average VS2-SI1 clarity. 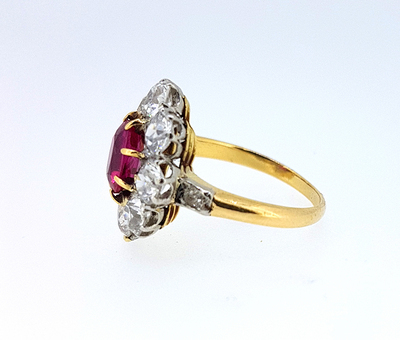 The combined weight of all stones included diamonds and ruby are embossed on the inside of the ring and read 30 145, i.e. 3.0 carats of diamonds and 1.45 carat ruby. 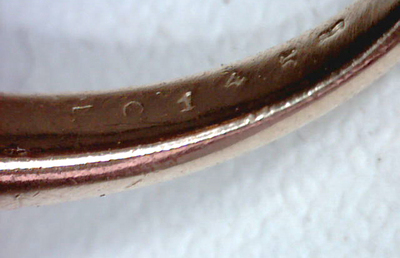 The oval top of the ring measures 18x15.5mm and gross weight is 5.5 grams in 15K gold and platinum. The top of the ring is supported by a wave like pattern of yellow gold. 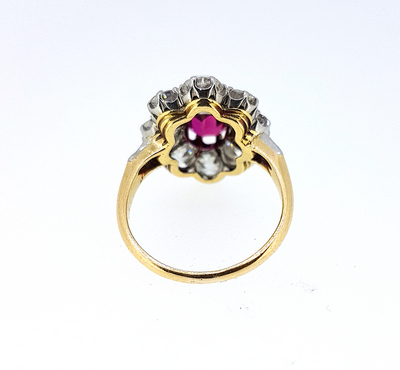 Ring size is 52 (US size 6 / UK size L), but can easily be resized. 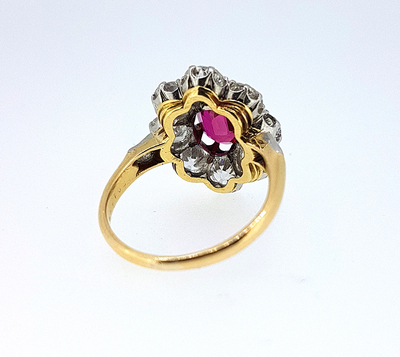 Scarce antique jewelry collector piece and one of the very nice and lovely Victorian era ruby flower pansy design and fashion rings and jewels.